Average advertising revenue per user (ARPU) continues to rise for Facebook, according to the latest company reports. Advertising ARPU reached $6.01 worldwide in Q3 2018, up 2.04% from the previous quarter and up 20.9% from Q3 2017. This is despite a number of recent challenges and controversies for the company, including the widespread presence of illegitimate accounts, the introduction of GDPR and the Cambridge Analytica scandal. North America registers both the highest advertising ARPU and the greatest growth rate, reaching $27.11 per user in Q3 2018. This is a rise of 6.61% from the previous quarter and nearly one-third (31.0%) from the previous year. 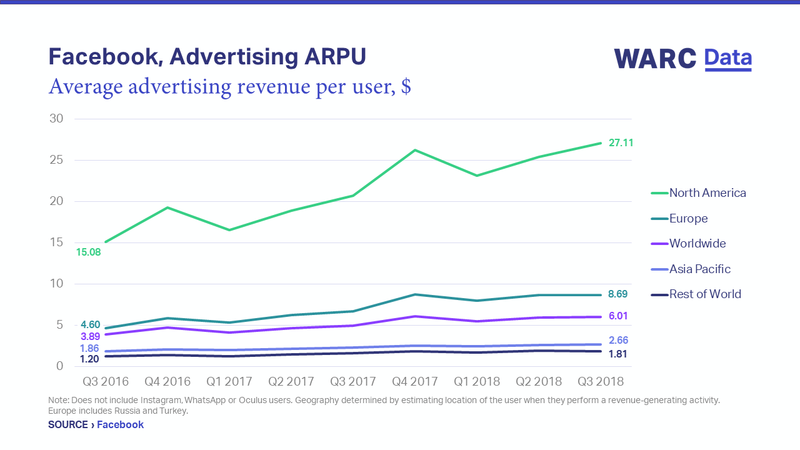 While Europe registered one million fewer monthly users, a rise in advertising revenue has meant it also saw ARPU grow. The region saw levels rise 0.81% from the previous quarter and 29.3% from Q3 2017.